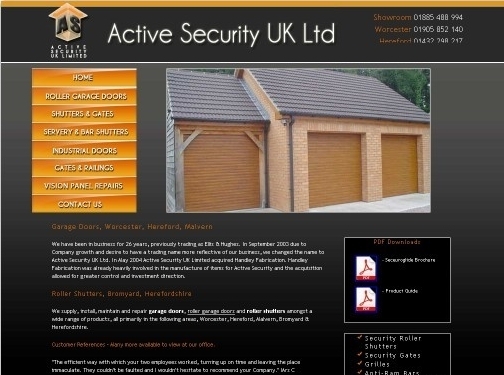 Active Security UK provide a wide range of services including garage doors, roller shutters and much more. They offer these services throughout Worcester, Hereford, Malvern, Bromyard and the surrounding areas. UK (Bromyard, Herefordshire) based company - established over 26 years ago (as of 2012) - providing garage doors and roller shutters for sale. Website includes details of products and services provided, downloadable product guide (PDF), full company contact details.